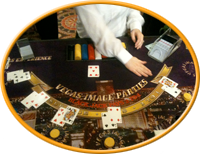 Vegas Image Parties is the premier Texas Hold-Em Tournament company in North Central Texas. Our tournaments are done by our highly professionally trained staff, computer technology, and experienced tournament directors. Holdem Tournaments are the way the majority of casual holdem players like to play holdem. Within the “Casino Party” we can do several of these “Turbo Tournaments”. The way we do them it is basically a “Sit and Go” Tournament. 9 or 10 people can sit down at the holdem table and put up 2,000 in Casino Chips (not alot chips respectively) and we draw for the Button and start dealing the tournament. The Blinds will go up every 5 minutes and we will produce a winner within 45 minutes. We payout for first and second places. This is a great way to achieve the tournament aspect for a lot of guests. And they love it! Please let us know and we can implement this at the event very easily.